If you remember your Korean War history from high school, you’ll likely recall that the 38th Parallel, or line of latitude, was important because it marked the border between North and South Korea. In Natural North Florida, and in terms of snook fishing, we have an important line of latitude, too. Eons ago, when I was a kid, there was a “regular” snook fishery at Crystal River. 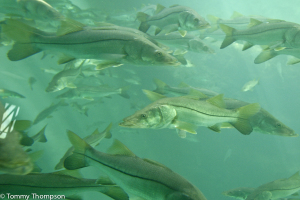 Since then, we’ve had off-and-on cold snaps every five or six years that killed lots of snook taken unawares of the temperature drop and pushed that northern limit back to Anclote Key, off Tarpon Springs. But in recent years, we’ve not had many really bad snook kills, and the northern limit is sneaking northwards again. In past years, lots of snook have been caught at Cedar Key, Waccasassa and even at Salt Creek, north of Suwannee. So… the old boundary of the 29th parallel, at Yankeetown and the mouth of the Withlacoochee River, just isn’t as “solid” as it used to be. That’s important, as snook season opened on March 1 and you can land one, take his photo, and maybe even eat him. But just one, please. I think you’ll find that our Big Bend snook are not picky when it comes to what they’ll attack in the way of lures. Down south, they’re pretty much tuned into white bait (sardines, glass minnows) and sometimes won’t even give an artificial lure a second look. However, we don’t have as much white bait in our inshore waters so they’ll readily attack almost anything that’s light-colored and/or shiny. The new 4-inch D.O.A. CAL (in glow) seems to work well, as does D.O.A.’s 3-inch shrimp (glow with a fire tail). But they’ve also been known to readily attack lots of other shiny offerings, like Live Target Scaled Sardines (suspending, one of the Unfair Lure’s slow-sinkers (Paul’s Unfair Greenie), or the old standby—the 52M18 MirrOlure. 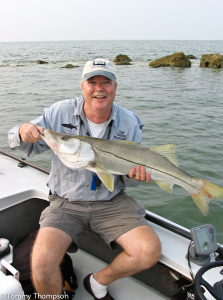 Fly anglers should consider tossing what I consider to be the best snook fly ever, Norm Zeigler’s white “Schminnow”. Of course, free-lined shrimp (the bigger, the better!) are good, too. Just remember that snook are not fooled by old or damaged live bait. They want them frisky!